Biodiesel purification is a crucial process in meeting fuel grade standard specifications. Inadequate purification results in a low-quality fuel and hampers engine performance. Conventional wet and dry washing along with membrane refining technologies are the most discussed methods in the literature for biodiesel purification. The conventional wet washing is performed using organic solvents, deionized water, or an acid solution. However, these methods result in a large quantity of wastewater, which creates a significant cost for wastewater treatment besides environmental impacts. Dry washing techniques were introduced to address this deficiency. In these methods, an appropriate adsorbent media such as Magnesol, an ion exchange resin, or active carbon is utilized to remove the impurities. The challenges associated with wet and dry techniques motivated scientists to seek more innovative techniques. Regarding biodiesel purification, organic and ceramic membrane technologies have received increasing attention. Biodiesel upgrading is an alternative route for producing diesel-like fuels with properties that can exceed conventional petroleum diesel. Since oxygenated moieties of biodiesel are the main reason for its poor fuel properties (e.g., high viscosity, low energy density, low chemical stability, and poor cold flow behavior), most of these upgrading techniques have focused on deoxygenation pathways. Hydrodeoxygenation using various catalytic systems have also been studied extensively to produce renewable diesel with high yields and high carbon efficiency. 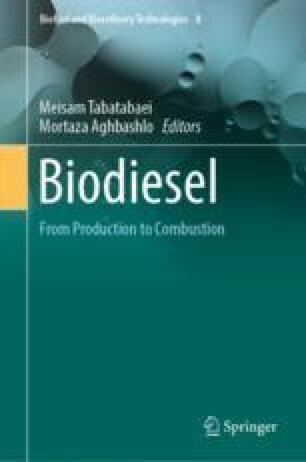 This chapter presents the basics and applied aspects of biodiesel purification and upgrading along with an overview on different techniques, challenges, and the overall trend of research.